In a letter to his friend, the playwright Anton Checkhov wrote,”One must never place a loaded rifle on the stage if it isn’t going to go off. It’s wrong to make promises you don’t mean to keep.” This idea was the foundation for the concept known as ‘Chekhov’s Gun’. Every significant element in a fictional narrative must be necessary and irreplaceable. There are a lot of loaded rifles in 10 Cloverfield Lane, metaphorically speaking, but only some of them go off. It wouldn’t be of a problem if there weren’t so many in the first place. 10 Cloverfield Lane shoves unimportant rifles in your face. Secrecy and misdirection have played an important part in producer J.J. Abrams’ career, perhaps to excess and often to the point of gimmick. 10 Cloverfield Lane, directed by Dan Trachtenberg from a script with five writing credits, is plagued by similar sensibilities. Plot elements that should have been meaningful and are suggested as such simply are not. Red herrings are well and good, but their function, aside from misdirection, is to make the mystery reveal the more satisfying. Too much is what it seems in 10 Cloverfield Lane. The name doesn’t help. That people have been guessing blindly as to the connection of the film to Matt Reeves’ 2008 found-footage monster film, Cloverfield, has a lot to do with the fact for a long time, there was no connection. When Abrams’ production company, Bad Robot, developed an interest in a script by John Campbell and Matt Stuecken called The Cellar, an association with Reeves’ film began to emerge. It’s a difficult element of the film to discuss without conveying what’s best kept secret. The secrets in this film are what make it enjoyable. The answers to those secrets let it down. The monster you know or the monster you don’t. 10 Cloverfield Lane has a strong premise that is never entirely done justice. A woman is driving through the night, escaping a turbulent marriage. This is almost all we’ll ever really discover about Michelle (Mary Elizabeth Winstead), the protagonist of 10 Cloverfield Lane. The information also has very little bearing on her character or what follows. In J.C. Chandlor wonderful film, All Is Lost, we’re offered even less information on the wordless protagonist, but it’s enough to lay the foundations for the decision he subsequently makes. This is the first opportunity lost to 10 Cloverfield Lane. It’s a film full of potential that sidesteps a lot of it. Michelle’s car is hit by an oncoming truck. She wakes up in an empty room with no windows, chained to her bed. Her immediate instinct is that she’s been kidnapped. Howard (John Goodman) enters the room through a forebodingly secure door. He tells her that he saved her from the wreckage and informs her that the America is under attack, everyone else is dead and that they’re currently in a bunker, constructed by Howard, deep underground. The only other occupant is a man named Emmet (John Gallagher Jr.), who claims to have known about the bunker previously and forced his way in when the attack began. Guesswork is integral to the suspense in 10 Cloverfield Lane, regardless of whether the answers are a satisfying conclusion of that investment. Howard may be a dangerous sociopath or he may be a kind-hearted farmer with social disadvantages. He may be telling the truth about the outside or he may not be. You’ll want 10 Cloverfield Lane to be as clever as it appears to be. Goodman’s performance is as clever as the film appears to be, towing a morally ambiguous line until the narrative imposes clarity. It’s a straight-forward film. 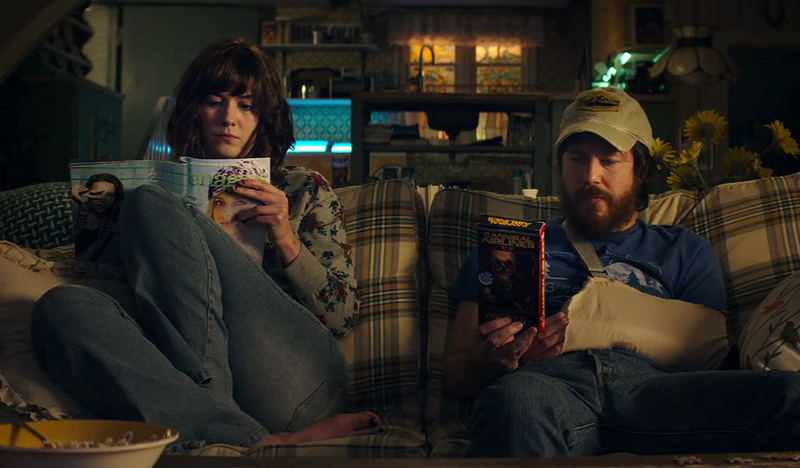 Individual moments in 10 Cloverfield Lane suggest the film that it could have, and perhaps ought to have, been. But the narrative as a whole is disjointed. Films that keep you guessing work best when the separate pieces logically point towards the conclusion upon reflection. There are no clues in 10 Cloverfield Lane. There are just things that happen.